Jagtar Singh Johal travelled to India for his wedding, where he was kidnapped and imprisoned by officers in plain clothes. During his time in prison, it has been widely reported that the Dumbarton man has been tortured both physically and mentally. Whilst Jagtar’s family were due to meet former Foreign Secretary Boris Johnson after pleading for help, Johnson resigned before the meeting took place. 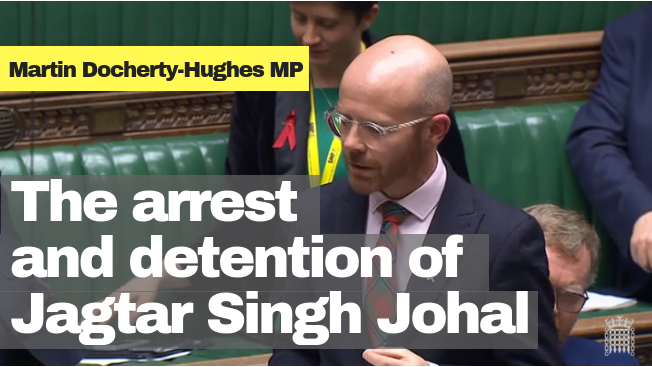 Jagtar’s local MP, Martin Docherty-Hughes, has raised the issue in the House of Commons and written to Ministers a number of times since Mr Sing Johal’s imprisonment, but without success. “The lack of action from the UK government in Jagtar Singh Johal’s case has been astounding. Whilst successive Foreign Secretaries have failed to make any real progress, it’s now time for the UK government to get serious about protecting UK citizens abroad. “My constituent’s shocking description of his mental and physical torture have fallen on deaf ears in Whitehall, which perfectly exemplifies the lack of regard the UK government has for its citizens overseas. Over a year since my constituent was imprisoned, I hope that in bringing this debate to the House of Commons the Tory government will finally take decisive action to help my constituent.